Horses were introduced to Australia from Europe by the First Fleet in 1788, and more horses were imported later for a range of uses. Escaped horses went on to form feral populations, which eventually spread across a wide area. Today, there may be as many as 200,000 feral horses in Queensland, mainly in semi-arid western and north-western areas of the state. Feral horses can cause significant damage to soil and native vegetation, and compete with livestock for food and water. The feral horse is not a prohibited or restricted invasive animal under the Biosecurity Act 2014. Large herbivores, with strong legs well adapted to long-distance travel in search of food and water (similar appearance to domestic horses). Average size 1–1.6m shoulder height. Coat colour varies, ranging from bay (brown body with black mane and tail) to chestnut (orange), black, brown and grey. Coat hairs are short and fine, growing longer in winter. Can occupy wide range of habitats, although best adapted to open grassy plains. 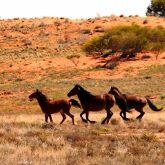 In Australia, feral horses inhabit range of habitats, including deserts, semi-desert plains, rocky ranges, tropical savanna grasslands, forests, scrubs, subalpine mountains, small offshore islands and even some wetlands. Widespread and abundant across western and north-western parts of state, with smaller populations scattered across bushland areas in eastern Queensland. Oldest recorded feral horse is 57 years old. Average life span is 25–30 years. Both males and females can reproduce at early age (18 months–3 years), but females do not physically mature until about 4 years, and males generally do not breed until they achieve dominance at about 5 years. Females older than 4 years are 'mares', non-castrated males older than 4 years are 'stallions'. Competes with cattle for food and water. A feral horse consumes plant matter comparable to that consumed by 1–2 cows. Lost Australian beef production has been estimated at $30–$60 million per year. Degrades soil by overgrazing and trampling, mainly around water holes. Damages watering points (particularly during drought), as well as fences. 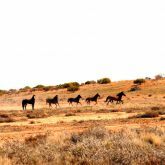 Disrupts station horses during stock mustering (feral stallions may take mares from station stocks and upset breeding programs). Removes native vegetation by grazing and trampling, with flow-on effects to native wildlife. Damages creek banks and waterways. Poses danger to drivers on some roads. Can damage Indigenous cultural heritage sites by raising dust, and by licking and eating artwork. Feral horses may be trapped in trapyards or mustered, provided mustering or trapping causes minimal distress to horses. Trapped or yarded horses can be killed humanely or domesticated. Ground shooting is discouraged because it is difficult to follow up on any wounded horses. Aerial shooting can be a humane control method when carried out by skilled shooters to control large numbers of horses in remote areas where mustering and trapping are not possible. Shooters must have appropriate weapons licences and necessary skill to kill feral horses with single shot. Lactating females should not be shot but, if they are inadvertently shot, young should be found and euthanased. The feral horse is not a prohibited or restricted invasive animal under the Biosecurity Act 2014. However, by law, everyone has a general biosecurity obligation (GBO) to take reasonable and practical steps to minimise the risks associated with invasive plants and animals under their control. Local governments must have a biosecurity plan that covers invasive plants and animals in their area. This plan may include actions to be taken on certain species. Some of these actions may be required under local laws. Contact your local government for more information. May be controlled as long as the requirements of the Animal Care and Protection Act 2001 are fulfilled.